Please excuse the ugliness of the mockup I made here, it’s just to give a quick visual idea of what I’m getting at. This essentially comes from the idea of focus targets in other mmos. When you’re looking in different directions during combat it can be difficult to see boss status displays at all, much less when they begin to cast. This is especially true with bigger enemies while you’re playing as a tank, though I feel a static status UI element could be useful for any job. I imagine this as showing the last target you hit, or perhaps we could lock onto a specific target by creating a button combination akin to how we enable auto-run. Adding this as a personal function to the tagger tool could work as well. It would be preferable to be able to customize where it gets pinned in your view, how big the display is, and an on/off toggle completely somewhere in our menu. To be clear, this is meant to stay at the forefront and locked in place as you move your head around. What do people think? Good idea, bad idea, or how it could be improved? Another potential idea for how it could be used is setting it to be a specific player in the party to be the pinned target, which would likely be most applicable to healers for keeping their eye on tanks. This could be accomplished by adding a button when you select someone in the party list. This is a good suggestion and it could lead to smoother ability recognition for players regardless of roles. This helps tremendously during encounters with multiple enemies where players will be switching their targets as needed, and an implementation like this would let them keep a tab on a particular enemy they needed to. Would be incredibly useful for healers in particular as well. Exactly. This is meant for being implemented in Reborn, I just didn’t have proper shots to make the mockups with. 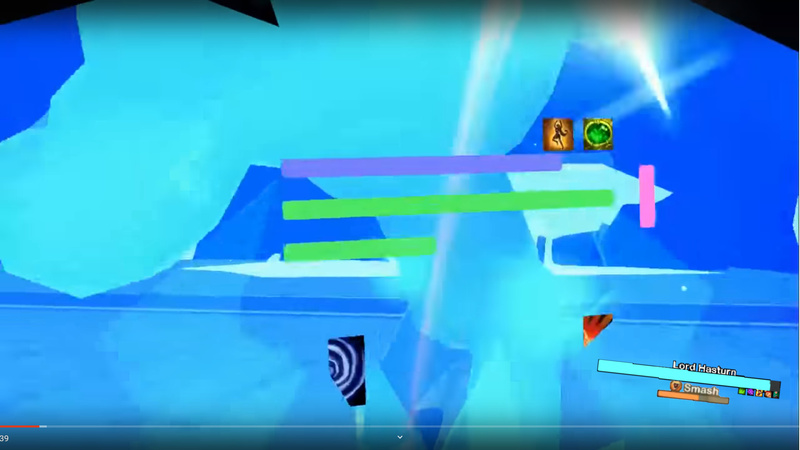 If you look, the top shot is raid boss 1, with raid boss 3’s status bar, with a smash cast bar from the big tree mobs in Reborn. The backgrounds were taken from various streams of mine and the tacked on focus target displays were pulled from various screenshots. The idea was to find pictures that really emphasize how this could be helpful. The top shot as a WAR, you can see the boss in a situation where he’s about to swing but unless you were looking way up at the time of blocking you probably wouldn’t notice. The bottom shot as a MSK is supposed to convey that while my tank Asterisk is still in the shot, I’m clearly focused on casting on the group and if he was to go behind the boss during this time I would have no idea what his HP is at or what buffs he has on. Plus it can be hard to tell at these distances too. I guess Asterisk didn’t really have to be in the shot at all, he could be out of my view in a real situation. I thought it would be a bit more impactful though to actually see he was there somewhere. The goal here isn’t to make the game easier. It’s to expand our toolkits to allow for more complex fights and freedom with which to design them in. Tools such as these would help raise both the skill floor and skill ceiling simultaneously. I would like to see this as it would help coordination of lower and higher skilled members of the community leading to a better experience; I am thinking that this mechanic could give the tagger tool more use and incentivize more people to get or have it. It would have the tags which are not too useful but then also have another mode that allows players to tag allies and enemies and display the name of that player or enemy and their health bar in front of you or on your weapon. Musketeers would be able to have two tags due to tagging the tank or tanks and the boss. One thing we need to keep in mind is how much room we can use without getting in the way of what’s already in front of us. Since it has to be pretty universal, think about how well you could fit that in with how full the Bard’s UI is. I think there’s no way we could have an actual party list in our view without blocking too much information, but two separate tabs could be sorted with customization, I agree. One think I know from VR development is that UI’s tend to feel really bad in practice. So hovering on the screen may cause discomfort. However I do like the idea of it being attached to the shield or maybe another bar under your super bar. I recently had a similar thought, especially because these mockups are in a resolution we don’t see in VR. We wouldn’t have nearly this much room to move and position a focus target display, and at that size it would be difficult to read it effectively. So your point about putting it on weapons as Orbus currently has it, definitely has merit as the better way to go. The only thing I think would not work well about it is that you’d have to hold still for a bit to see what it was. Which isn’t all that bad to be honest. I still think it would produce the most effective results as a static UI element, if there could be a way to have it work effectively. That’s a lot more difficult to do than I initially imagined, so if there isn’t a way I’m certainly all in for your suggestion! So we’re actually working on a first version of a similar idea (great minds think alike, I guess) that will be available in the next Beta test. 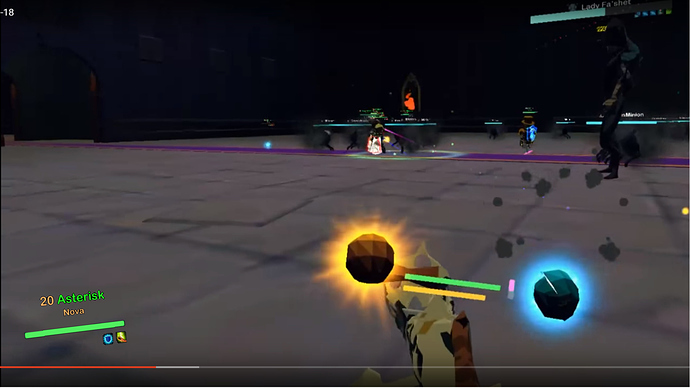 Essentially now when you attack a target, if that target’s health bar (status effects, casting bar, etc.) would be out of your view, it now moves to be within your view at all times. So this is basically great for tanks, since interrupting casting is going to be a major part of the new game. We also have it to where you can point to far-off enemies and it will bring their healthbar “forward” in your vision, great for scouting enemies to confirm difficulty levels and the like. We have talked about expanding this system to incorporate some sort of “pinned focus” healthbar but that won’t be in the first version of it. Could you also do this so we can see players names? You can’t really see a players name unless they are next to you. That’s great news, thank you so much. I really like how you say “if out of your view” because this helps keep your view cleaner and the game more immersive.